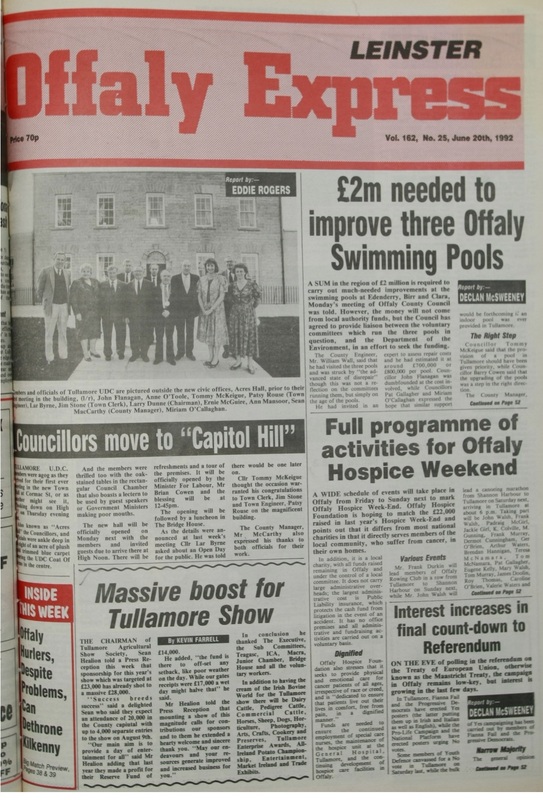 Funding for swimming pools, Tullamore Town Council offices opening and a 'Massive Boost for the Tullamore Show', were amont the stories making the front page of the Offaly Express on June 20, 1992. The front page also featured a report that €2 million was desperately needed to improve three swimming pools in Offaly. The money was not going to come from local authority funds rather the County Council would help the voluntary groups running the pools to get funding from the Department of the Environment. Elsewhere in Offaly in June 1992, there was news of a sponsorship boost to €28,000 for the Tullamore Show and a great week planned for the Offaly Hospice Foundation. Finally, as if to prove that a referendum is never far away in Ireland, Declan McSweeney reported that interest was increasing in the lead up to the vote on the Maastricht Treaty. For the record, 68.7% of the population voted in favour of the Treaty.